This script adds “corpse retrieval” functionality to your project. you will recover all of those equips. 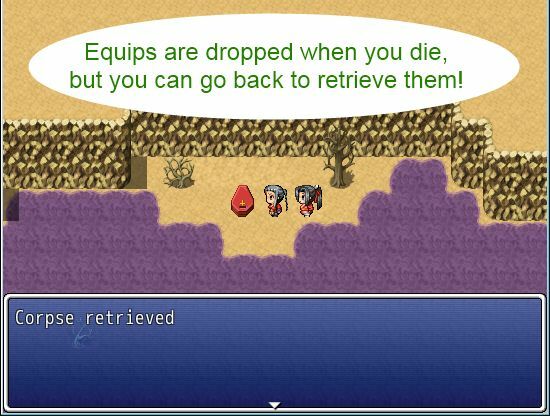 the corpse all lost equips will be recovered. A corpse is created everytime you die, even if you didn’t retrieve a previous corpse. There are not many configuration options available at the moment. Hi, is there a way to use the script before the game over scene, for example i am trying to use it with https://bravo2rgss.wordpress.com/checkpoint-system/ that creates a checkpoint and when you die but doesnt trigger the game over scene until you have no more lifes left. P.s.- im using several of your scripts for my game theyre awseome. Hi is this free for commercial? Yes, this is free for commercial use. Just provide credits. You need to make the script call. It doesn&apos;t do it automatically.